"The color yellow really inspired my work because it’s so bright and happy. I think it’s important to inspire others to be confident in themselves in all that they do. The quote “Shine Brightly” reminds people to walk in confidence and happy is the best look to have." Image Description: The words "Shine Brightly" embroidered inside of a sun with stars embroidered along the outside. 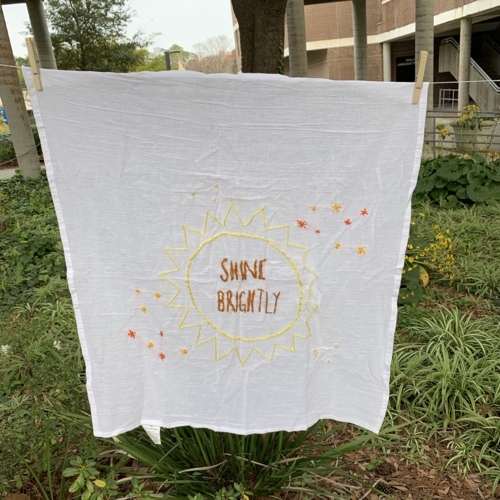 Peyton Guiry, “Shine Brightly,” Embroidering for Peace and Memory, accessed April 23, 2019, http://embroidery.unfdhi.org/items/show/213.